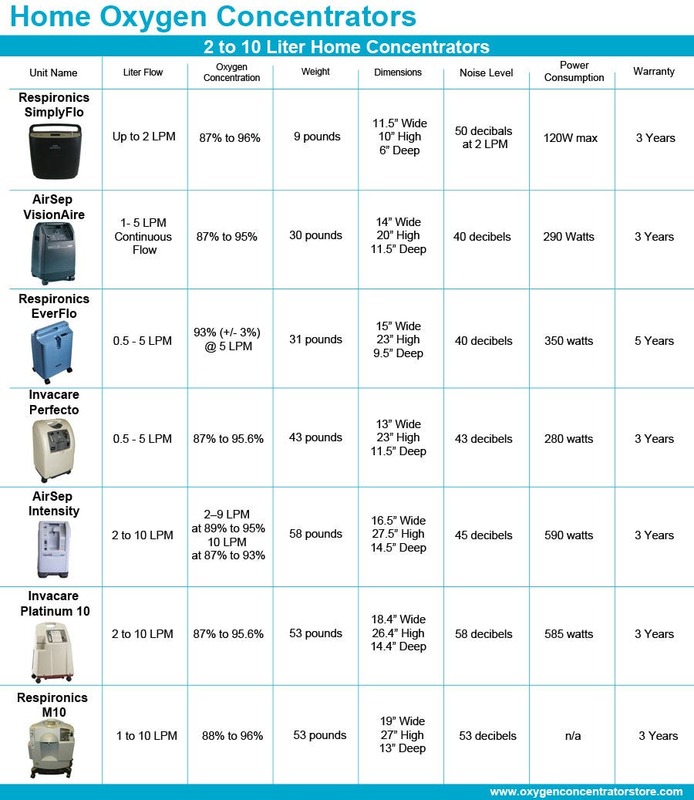 Which Home Oxygen Concentrator Is Right for You? Buying a stationary or home oxygen concentrator (HOC) is as important a decision as buying a television or a car, only more intimate. Like a car, the customer needs to find the concentrator that best fits their needs, as these products come in various sizes with various capabilities. Whether the user needs a concentrator that is easy to store, energy efficient, lightweight, or even for use at high altitudes, an HOC exists that can be customized to any situation. Oxygen Tanks can be volatile, and they need to be refilled. A portable oxygen concentrator (POC) is great for mobility, but because they are created for convenience, their smaller, lighter design lacks the power and output capabilities that stationary HOCs can provide. How Home Oxygen Concentrators Work? The ambient air around us consists of a combination of roughly 78% Nitrogen, 21% Oxygen, and 1% Argon. Stationary Oxygen Concentrators work to separate the Oxygen from the Nitrogen and Argon to deliver up to 95% Oxygen, subsequently increasing the oxygen saturation in the patient’s blood. HOCs generally use a process called pressure swing absorption. An air compressor, along with two zeolite-filled containers, is used to separate the Oxygen from the Nitrogen. Porous zeolite minerals work to absorb Nitrogen molecules from pressurized air, while allowing the other gases to pass through. Once the oxygen is extracted, the air is decompressed, and the nitrogen is returned from the zeolite, into the air. This quiet process allows for the device to output high concentrations of Oxygen. With each new model, the process has become more efficient, allowing for more consistent, higher concentrations of oxygen to be created while using reduced amounts of energy. Why Is A Continuous Flow Desirable? HOCs provide a continuous flow of oxygen, as opposed to the pulse or intermittent flow that some of their portable oxygen concentrator (POC) counterparts provide. Since they are not meant to be completely mobile, HOCs are heavier than POCs, and in turn provide increased Oxygen output within more efficient and stable parameters. A continuous flow of oxygen provides consistent, high levels of oxygen that allow the oxygen user to maintain an acceptable level of Oxygen saturation. Home concentrators feature oxygen outputs ranging anywhere from 2 Liters per Minute (LPM) up to 10 LPM. Pulse, or intermittent flows, deliver much smaller doses of oxygen which allow for a smaller, more easily portable design. This compact build also helps to preserve the battery life of the unit. Since an HOC can plug into a wall outlet, and does not need to be as mobile, battery life and size constraints are not limitations. How does one choose the best HOC for their individual needs? With dozens of models to choose from, picking an appropriate product may seem like a daunting task. To make the decision easier, it is important to narrow the search by determining which features are most important to the oxygen user’s specific needs. When picking out the right HOC, the most important factor to consider is how much oxygen will be required. Some of the higher capacity HOC models can output up to 10 LPM. If that flow rate of oxygen is not required, the smaller and less powerful model, producing anywhere from 1 to 5 LPM, may be the superior option. The next factor to consider is budget. Not only does the home concentrators have an initial cost, but it will have an ongoing impact on the household electric bill. Much like automobiles, HOCs are constantly becoming more and more energy efficient, and engineers are finding ways to improve their efficiency each year. Unlike POCs, there is no concern about the HOC’s battery life. There is no time spent charging batteries, or finances exhausted on replacement batteries. Because HOCs use the home’s electricity as their power source, the cost will show on the monthly electric bill. The more oxygen the concentrator produces, the more energy it requires. The more energy efficient models may cost more initially, but can save money in the long run. Though finances are almost always involved when making a purchasing decision, it is imperative that the unit purchased meets the oxygen delivery needs of the user. While considering current needs, users with chronic or unstable oxygenation requirements would be advised to consider their future needs, as well. If a oxygen user has a lung condition that will require more oxygen in the future, they will want to purchase a concentrator that can accommodate the increasing future need. It is unwise to purchase an HOC that has a 5 LPM maximum if the patient will require 6 to 7 LPM in the future. It is important to consult with your doctor to determine both current and future oxygen needs, prior to purchasing an external oxygen source. Strategic planning for the future will help to avoid an unnecessary purchase of another HOC down the road. An additional HOC aspect to consider is size. Oxygen concentrators are available in a wide range of shapes, sizes, and weights. Some models are smaller and can fit into tight spaces without a problem, as would be required for a patient in a small apartment or assisted living scenario. Some colors and designs will blend in with the user’s room decor, making them less noticeable for the user who is self-conscious about their oxygen therapy. It is important to take an inventory of where the HOC will be used around the home. Consider where, in the home, the majority of time is spent. Take note of where the home’s electrical outlets are located. How much space is available for a HOC? If space is tight or limited, a smaller, more petite model will be more appropriate. If the available space is vast and open, a larger, more powerful option may be a better fit. If the plan is to use the HOC in multiple areas, purchasing a model that will fit in the tightest space in which it will be used is a good idea. Planning ahead and buying a HOC that fits the spatial needs will save the concern of future functionality issues. Users should purchase an oxygen concentrator that accommodates their lifestyle, rather than having to change their lifestyle to accommodate their HOC. While HOCs are not created to go everywhere with their user, like POCs are, they are equipped with wheels which allow them to follow the user as he or she moves between rooms. This is where weight comes into play. If a device is too heavy to be easily moved, the oxygen user will only be able to use it in one place. If the user plans on using the concentrator in multiple rooms throughout the home, they’ll want to find one with a weight that can be easily handled. When comparing different HOCs, another important feature to analyze is the model’s ease of use. Oxygen concentrators are continually improving. Each new model has new features and settings that are meant to provide the highest possible quality of life. However, with so many different settings, certain models can become confusing to operate. The most useful feature is rendered completely worthless, if a complicated interface prevents the user from knowing how to properly operate their device. Before using the device for the first time, make sure to read through the user manual carefully. Understand what each figure in the display represents and understand how to properly change the settings. Having a complete understanding of how to operate the device, will allow the oxygen user to customize their device to make the user as comfortable as possible. Not understanding the subtle nuances of their oxygen concentrator can be not only dangerous but a waste of money and resources. Asking which home oxygen concentrator is the best is a complicated and user-specific question. There is no one-size-fits-all answer. Purchasing an home oxygen concentrator is not about finding the best product on the market. Instead, the patient needs to find the best product for their particular health issue and oxygen requirement. Once the patient analyzes their specific, individual needs, they can narrow their search to a select few products. This, in turn, leaves the patient with a much easier buying decision. Take into account how much oxygen the body currently requires, as well as how much oxygen the patient’s body will require in the future. Consider budget for the initial purchase price of the machine, as well as ongoing monthly electrical costs. Determining where the home oxygen concentrator will used, how much space is allotted for the device, and how much mobility will be required within the home and outside. The narrowing down process not only makes the buying decision easier, as certain models are ruled out based on needs, but it will also allow for a better future decision by purchasing a unit that can continue to provide for the patient’s needs. Choosing the stationary concentrator that is best for the oxygen user will assure that they are satisfied with the purchase and will add quality of life to their activities of daily living. Please contact at 1-877-774-9271 with any questions you have regarding a home or stationary oxygen concentrator.